To those youths who are imbued with the Australian love for stock, veterinary science offers a splendid opening for such as are in search of a profession. It is one, too, that is unlikely to be overcrowded, as are many others, for years to come. The time is approaching when all stock inspectors, dairy inspectors, and meat inspectors will require to be qualified veterinarians. Such positions, however, do not by any means exhaust the possibilities of the profession. More of these positions would now be restricted to men with the requisite training were it possible to get the men for the billets. The Federal Government, for instance, is unable now to obtain sufficient men of the required standard to fill inspectorships. In the circumstances it is a very fortunate thing that the Sydney University now affords opportunities for a high-grade training in this profession, and there is no doubt that those students, who graduate there will have an excellent standing among qualified veterinarians. 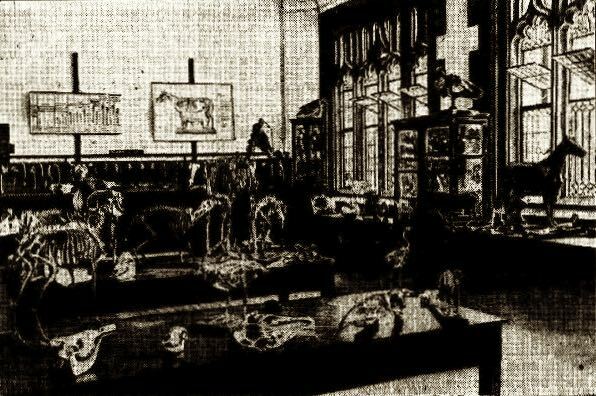 The accompanying illustration is a view of the Museum of the School of Veterinary Science at the Sydney University. It indicates the progress made during the first year of the school's existence. It now contains the skeletons of all the domestic animals and many interesting models and dissections. At present the school is located in the Fisher Library buildings, but it will shortly be removed to the new building now being specially erected for the purpose on a site in the University grounds, near the Parramatta-road. In order that the school may be equipped in the most efficient manner, the senate has approved of Professor J. Douglas Stewart visiting the lending veterinary centres of the world. During his absence Dr. Sydney Dodd, F.R.C.V.S., who has done much excellent research work in Queensland, will take charge of the school and lecture on veterinary anatomy, with Mr. Baker as demonstrator. The other subjects of the first and second year of the veterinary science course are provided by the departments of chemistry, physics, biology, and physiology. For the following year additional lecturers are to be appointed, and upon the professor's return the construction of the veterinary hospital and the section for research of animal diseases will receive attention. At the inauguration of the school in March last 15 students joined, and a number of applications have already been received for admission next March. The Federal Government alone advertised for nine veterinary officers last month, and as other avenues for employment are available, the prospects of the profession, as already indicated, appear bright, especially when it is remembered that veterinary surgeons of the present are not only taught to treat animals medicinally and surgically, but are extensively trained in other branches of the science. VETERINARY SCIENCE SCHOOL, SYDNEY UNIVERSITY.